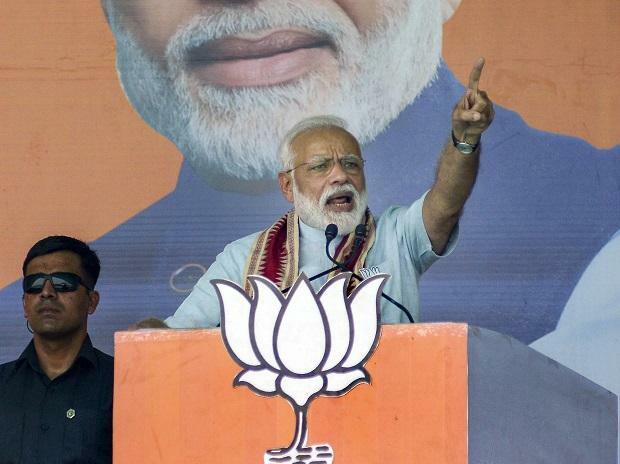 Prime Minister Narendra Modi Saturday said that while the "chowkidar" has demonstrated courage to hit terrorist safe havens inside Pakistan, the Congress wants to dilute the powers of the armed forces. The prime minister has on several occasion said he's the chowkidar (watchman) of the country and serves to protect its best interests. The prime minister said people have to decide whether they want to choose an honest and principled government committed to the development of all, or a corrupt and unprincipled one. "This time lotus will bloom in Odisha. The BJP will taste victory. I can say with certainty that the maximum number of lotuses will bloom in the state," PM Modi said. He said the BJP has been guided by stalwarts such as Deendayal Upadhyaya, Atal Bihari Vajpayee, Lal Krishna Advani, Jagannathrao Joshi, Rajmata Scindia and Murli Manohar Joshi. The prime minister said people across the country have embraced the BJP and reposed faith in the party which can be seen from the fact that the party has formed government in a large number of states. This was Modi's third visit to Odisha in a week in the run-up to the elections. He had addressed rallies in Jeypore and Bhawanipatna on March 29 and April 2, respectively.